If you expected me to be shocked that the markets sold off for the first three days of 2008 then you did not read my commentary last Sunday. I warned for the last two weeks that the first few days would be rough and for me the first real market day for 2008 would be Tuesday the 8th. I warned that funds would be free to take profits now that we are in a new tax year and that is exactly what they did. 75% of the entire Nasdaq gain in 2007 was on the back of GOOG, AAPL and RIMM. Those profits were at risk for selling and so far GOOG has lost -8%, AAPL -10%, RIMM -10% and AMZN -10%. I was not surprised that the winners were sold hard but I would be surprised if it lasted past next Tuesday. Network analysts were blaming the market meltdown on the Jobs numbers on Friday and while that did help accelerate the selling it was not the cause. The Jobs report was a shocker to some but I warned you last weekend that the whisper numbers were under 50K with many nearing zero. 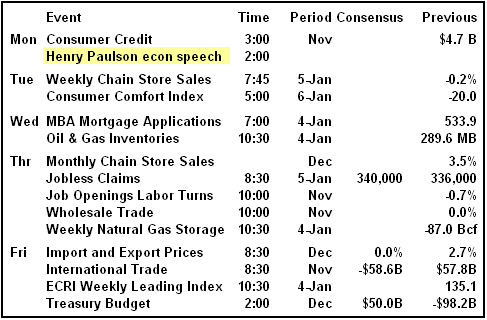 Jobs for December came in with a gain of only 18,000 and well under the "official" consensus for a gain of 70,000. Fortunately gains reappeared in November with an upward revision from 94,000 to 115,000. The total for Oct-Nov rose to +274,000 and offsets the meager 18,000 gain for December bringing the 3-month average to 97,300 new jobs. This was actually higher than the 3-month average for Q3 at 76,600 jobs. It is the way these numbers appear on a monthly basis that creates the consternation in the markets. Having only an 18,000 job gain in December sounds significantly worse than averaging 97.3K for Q4. December was not expected to be a strong month for jobs so this should have been even less of a surprise. We are still on a downward slope regardless of how you view it. I charted the monthly jobs in the first graphic and then the trailing 3-month moving average in the second graphic. Both paint a picture of slowing job gains but the pace appears manageable in the 3-month chart. Average monthly job gains for all of 2007 were 111,000 per month but that is well below the 2006 average of 189,000. There were sharp drops in construction jobs (-49,000), manufacturing (-31,000) and retail (-25,000). The job diffusion index fell to 48.4 and the lowest level since 2003 suggesting the tide has turned and more companies were cutting back jobs than adding jobs. The unemployment rate spiked by 30 basis points to 5.0% and the highest rate since Nov-2005. This is a major red flag for the economy if it is true. The rate bottomed at 4.4% back in Oct-2006. The jobs report will increase the chances of the Fed cutting rates at or before the Jan-29th meeting. The jobs data is not what it appears on the surface and that could have caused some additional background selling. The Non Farm Payroll (NFP) report contains an estimate called the birth-death ratio. In December 66,000 jobs were added as a result of this estimate. Basically the Bureau of Labor Statistics (BLS) does two surveys per month. One is the NFP and the other is called the Household Survey. For the NFP the BLS calls 160,000 businesses at random out of their database of 9 million. They ask a few employment questions to get the base for the NFP numbers. The BLS knows the method is flawed since larger corporations tend to stay around and get called repeatedly while small companies tend to disappear, move around or simply get passed over in the census. New companies are normally small and don't show up on the radar for years. The BLS has found that by averaging prior years of data they can compensate for this by adding in the birth-death ratio of new jobs as an average of prior periods. The BDR added 66,000 jobs in December of which 17,000 were supposed to be in the financial sector. Do you really think the financial sector added 17,000 jobs in December? Of course not, this was about the number from 2006 and 2005. When the economy is expanding this BDR will underestimate jobs and when the economy is shrinking it will over estimate jobs for about 12 months in both directions. That means while the economy is sinking into recession it will appear we are doing better in employment that we really are. Since February the BDR added over 1,239,000 jobs to the NFP. Since January the NFP has only shown a gain of 1,208,000 jobs. Does it seem right that the BDR added more jobs than we actually counted? I don't think so but the household survey goes even further into fuzzy logic. In the Household Survey the BLS calls 60,000 homes at random and asks them employment questions. In the December household survey they showed a loss of -436,000 jobs for the month. This is where the unemployment percentage is derived and that sharp drop in jobs is why the unemployment rate spiked +30 points in one month while the NFP was still showing a job gain. The Household Survey is rarely discussed since the numbers vacillate so widely. In just the last month we went from a gain of +631,000 jobs in November to a drop of 436,000 in December. The variations come from large changes in the population numbers. For instance the civilian population rose from 232,939,000 to 233,156,000 in December. They assume 66% of the population were employed based on the responses received from their 60,000 phone calls. That equates to employment of 146,211,000 in December. It is hardly a precise method but it is the one used to calculate the unemployment rate. They calculated that the number of unemployed rose to 7,655,000 (+474,000) or 5.0% of the 153,866,000 currently employed. You can see why this data is not reported. It would cause the general public's eyes to glaze over. Instead we get the sanitized version of the non-farm payrolls as our beacon of sanity in the job market. Also helping to increase those chances of a rate cut was the drop in the ISM Index on Wednesday into contraction territory at 47.7 for December. This was a drop of -3 points from the barely positive 50.8 in November. This was the sixth consecutive month of declines in the index. The last time that happened was in 2001. The headline number of 47.7 was the lowest since 2003. This is as close to a real time number as we get on the state of the manufacturing economy. The ISM Services was released on Friday at 53.9 and it was nearly unchanged from the November reading of 54.1. The services sector is not healthy but it is holding just over contraction level and roughly where it has been since July. Employment rose a point to 52.1 but that could have been related to holiday jobs like catering parties and handling holiday events. January's ISM employment number will be more critical. 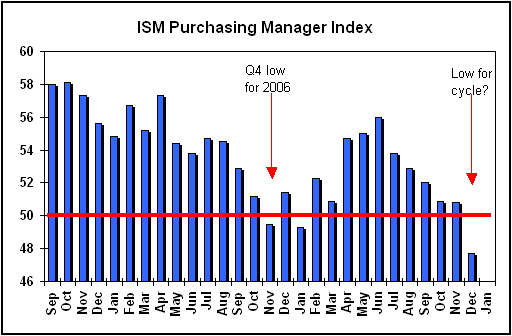 The ISM Manufacturing did break under 50 but the 4th quarter is not historically a strong quarter. In 2006 the low for the year was Q4 and we could be seeing the same cycle trend in Q4 2007. The Fed got a strong dose of exposure to recession flu last week but it remains to be seen if they caught a fever. The Fed funds futures are projecting a 160% chance of a 25-point rate cut when they meet again in a little more than 3-weeks. Goldman Sachs and JP Morgan already jumped into the fray on Friday with their forecast for a 50-point cut to 3.75%. Goldman also suggested we could see an intermeeting move before the regularly scheduled Jan-29th meeting. They believe the Fed will want to fight the recession fears rather than focus on inflation during Q1. Recessions are more damaging than inflation and should be at the top of the Fed's priority list. Once the economy begins to show growth again they can shift their focus back to inflation. The Fed announced late Friday they would offer another $60 billion in TAF loans (Term Auction Facility) similar to their first offering of this type. They will increase the amount offered to $30 billion on each of the next two auctions. Those auctions will be on Jan-14th and another on Jan-28th, the day before the FOMC meeting. The Fed saw its last auction of $20 billion oversubscribed by 300%. The Fed announcement said they were planning on continuing the auctions every two weeks for as long as it takes to address the pressures in the short-term funding markets. The prior two auctions brought in bids of 4.67% and 4.65%. That is more than the current Fed target of 4.25%. On the economic calendar for next week there are not any events that I deem as critical or as market movers. Those that are material are lagging indicators and already factored into the equation. The most important event may be Treasury Secretary Henry Paulson's speech on Monday on how the markets are recovering from the credit crunch. I believe the most important quasi-economic events for next week will be any further earnings warnings for Q4. Dow component Alcoa officially kicks off the earnings cycle when they report on Wednesday but the real earnings calendar does not fill up until the week of Jan-21st. That gives everybody planning on reporting after Jan-21st another full week to warn if earnings are going to be less than expected. This should happen next week if we are going to get an earnings dump. So far warnings have been very light except for financials. Earnings estimates for the S&P for Q4 have declined to an expected loss of -9.5% and ending decisively our long string of earnings growth quarters. The earnings damage is almost entirely due to losses in financials. If you remove the financials from the S&P equation the earnings would still be expectations for +12.5% growth. By themselves earnings estimates for financials are expected to drop -66%. Earnings for energy and techs are still rising. The economy can't be too bad if tech stocks are still raising estimates but now the fears are starting to appear that even those bulletproof sectors may be in trouble. 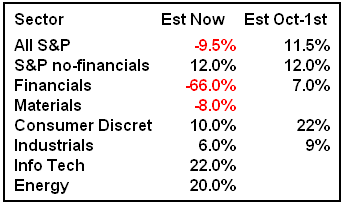 Consumer discretionary and Industrials are the only other sectors to show material estimate declines. Financials and Materials are the only sectors with negative expectations. The problem remains the subprime induced gridlock. In the FOMC minutes released last week for the Dec-11th meeting the Fed noted the risk of an "unfavorable" feedback loop in which credit market conditions restrained economic growth further, leading to additional tightening of credit. The Fed said such a compounding cycle of ever tightening conditions could require "substantial" further easing of Fed policy. Currently banks do not want to lend to other banks because they are not comfortable with the credit quality of those banks. There is simply too much subprime damage still unknown and other banks need to restrain lending to maintain adequate capital. This is keeping the pressure on financial earnings estimates on fears that there will be even more write-downs to come. This fear on the part of the Fed along with the sudden weakening in the ISM and Jobs should cause the Fed to react strongly to the changing events. The financial stocks are still declining with analysts expecting the mother of all write-down cycles ahead of Q4 earnings. Citi (C), Bank America (BAC), Countrywide (CFC), Bear Stearns (BSC), Wachovia (WB) and Wells Fargo (WFC) among others all hit new 52-week lows on Friday. Fear is rampant in financials and that is rubbing off on the rest of the market. That also suggests we are nearing a bottom in the financial sector but it could take several more weeks for it to appear. S&P expects financial earnings to fall -66% in Q4, -11% in Q1 and then be up +25% by Q4-2008. John Mauldin brought a company to my attention this week named ACA Capital Holdings. (ACA) ACA wrote credit default insurance on CDOs, $70 billion worth. After losing over $1 billion in Q3 and having their debt-rating cut to nothing they are in default and have to come up with nearly $2 billion in cash by Jan-18th or be deemed insolvent. On Dec-27th the company entered a consent order with the Maryland Insurance Commission giving control of the company to the commission. The New York Times reported last week that Merrill, Bear Stearns or possibly another large firm could take them over. The reason is simple. If they go under the $70 billion in CDO default insurance becomes worthless and those CDOs become worthless. It might make sense for somebody big with lots of ACA exposure to step into the gap just to save their own positions. The problem is that they would take on the risk of the other $70 billion in positions that was not theirs. This same ACA scenario could be happening to the other dozen or so firms that dabbled in this market. Odds are good there is more pain to come for the financial sector in January. The chip sector was knocked for a 10% drop after both JP Morgan and Bank America cut Intel to neutral. Intel itself fell -15%. The JPM analyst cut Intel on concerns over slowing orders and rising inventory levels. He said processor growth had been rising at an annualized rate of 16-20% for the last two quarters and the highest level since the Y2K surge in 1999 and double the historic average of only 8% growth. He said order weakness was appearing in Europe and could be spreading. AMD hit a new 5-year low at $6.25 after a Wachovia analyst warned that Intel was well ahead of AMD on quad-core processors. Intel has been shipping the fastest quad-core processors for well over a year while AMD is still struggling with design problems. AMD hopes to have the design problems with its quad-core chip code named Barcelona fixed by March. That is nearly a 2-year head start for Intel and Intel is ready to announce faster versions in the coming months. Any day the market is open is a good day to sell AMD. Next week the Computer Electronics Show (CES) opens in Vegas with 140,000 attendees and over 3,000 exhibiting companies across 1.8 million feet of floor space. This is the largest electronics show in the world and all the new toys will be exhibited. Home theaters, gaming, cameras, phones, home networking, vehicle electronics and dozens of other categories will be on display. This should give tech stocks a boost simply from the hype surrounding the new devices and their components. The Macworld convention comes the following week from the 14th to 18th and Apple is expected to make even more announcements that could spur buying in tech stocks. One jump-start to the CES show was an announcement late Friday that Warner Brothers was going to support the Blu-ray format for high definition DVD technology. That major win in the studio wars will be touted by Sony (SNE) at CES next week. There are some thoughts that Apple Computer will also pick a favorite the following week at MacWorld. Sony is the major developer behind Blu-ray. The battle lines appear drawn since Microsoft is expected to announce in its high profile keynote address at CES that it will support the competing HD-DVD in its Xbox 360 product. This brings back visions of VHS vs BetaMax and the videotape format wars. Many analysts are claiming it will not make any difference since the future appears to be a downloadable HD product rather than a flat disk. Apple is rumored to be announcing a new DVD component (HD or Blu-ray) to its Apple TV product at MacWorld but that may just be speculation. Warner Brothers said consumers had spoken in choosing the format rather than an internal WB decision and WB would cancel plans to distribute videos on both formats. Sony already has exclusive deals with Disney, 20th Century Fox and Lions Gate. HD-DVD has exclusive deals with Universal and Paramount/Dreamworks. The WB switch may be just enough weight to end the battle but the two main proponents of HD-DVD remain Microsoft and Toshiba and they have deep pockets. Just how much money they will want to spend to remain on the outside of the mainstream remains to be seen. Had WB made the announcement a month ago there would have been a lot more Blu-ray DVD components sold ahead of the holidays and a lot of HD-DVD players heading back to distributors today. BoBond rating agency Fitch cut YRC Worldwide (YRCW) investment grade debt rating to junk status on Friday citing a weakening credit profile and tough market conditions. YRC (Yellow Roadway) fell -9% and hit a new 2-year low at $12 on the news. 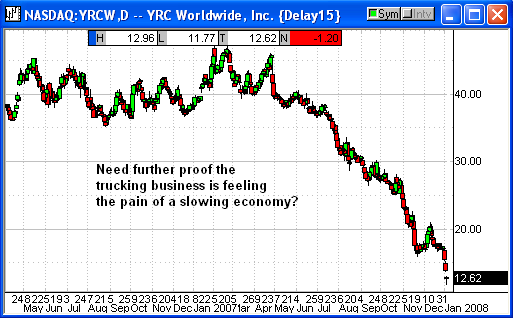 Fitch said the less-than-truckload market in the U.S. had weakened significantly in the past 18 months. According to Fitch poor pricing and over capacity was a result of slumping demand. Fitch expects earnings to come in under expectations for the near future. FedEX (FDX) also slumped to a new 2-year low at $84 due to the guilty by association rule. UPS was impacted less but still fell to its 2-year lows. 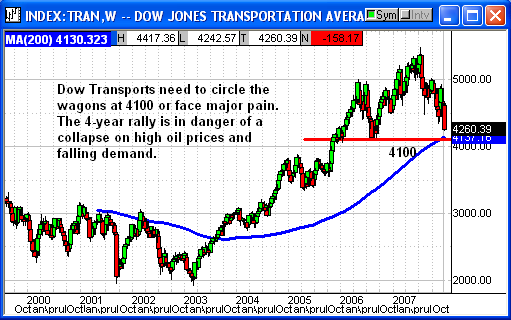 The Transports are just a handful of points away from a major breakdown under 4100 and the bottom set in August 2006. High fuel prices have been dragging on the transports and specifically airlines for months. The markets roared off to the worst start since 1932 with a -565 point drop in the Dow and -170 point on the Nasdaq. I warned you last weekend to expect selling in AMZN, AAPL, RIMM and that even Intel and Microsoft were at risk. Those first three I mentioned were down -10% for the week. That should have been no surprise. I believe the majority of this decline was due simply to tax selling by funds now that 2007 is over. They can take profits now on 2007 positions and not have to pay taxes for a year. Secondly we are seeing billions in funds leaving the U.S. market and heading overseas through funds and ETFs. With the U.S. market apparently heading into a recession many investors want to shift money to an economy still growing. Russia funds were seeing strong inflows of cash as were Taiwan, Brazil and even China. The combination of tax selling and money movement was too much for the markets to bear. Going into next week I am setting up to be bullish. I believe the tax selling is basically over given the severity of the drop. I only projected three days when I warned you last week. Monday will be a cleanup day where remaining positions are dumped and margin calls covered. Traders coming back from an extended holiday will do a gut check and hit the flush lever. I told you last week that I considered next Tuesday the first day of 2008 and I have not changed my mind. There are qualifications to my bullish stance but I am looking for an entry point for at least a trade. Here is my qualification. The S&P started 2008 with the worst performance since 2000. 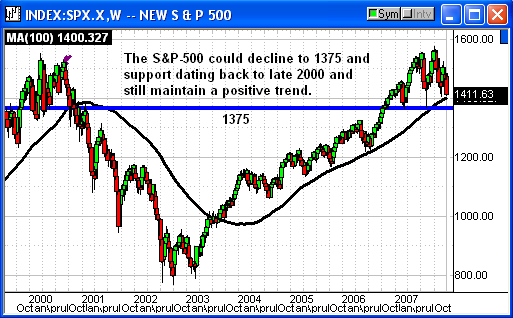 The S&P-500 has to hold 1400 on any further drop. That is the 100-week average and right at the closing lows from August and November. We are setting up for EITHER a triple bottom low/rebound OR a major breakdown from that level. A break of 1400 could find support at 1375-1380 but a break there would be a game changer. The Nasdaq lost -170 points for the week and plunged to 2500 at Friday's close. This is major support from August and the majority of the drop was in the major names. It was clear tax selling ahead of CES and MacWorld. Now those waiting for an entry point in those same names should be jumping into the gap early in the week to establish positions. The Nasdaq has risk to 2350 if current support and Friday's close at 2500 does fail. RIMM is expected to be a big winner at CES with a number of new devices to feed off the popularity of the BlackBerry. 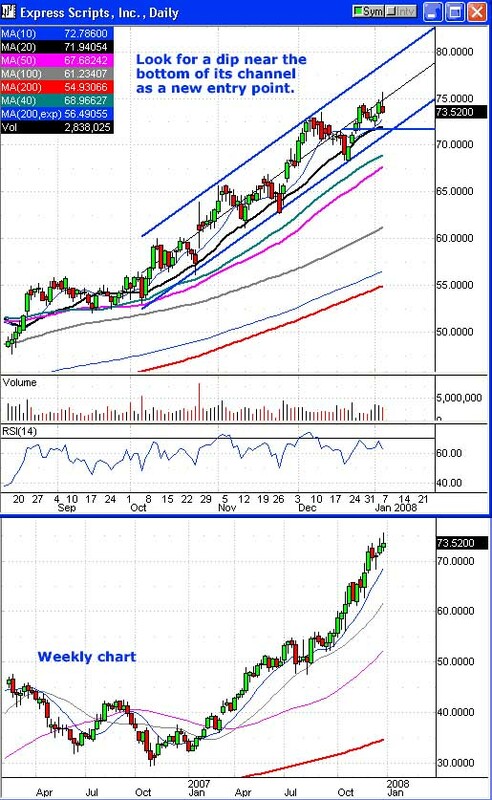 As long as RIMM holds $98-$100 I would still be a buyer. 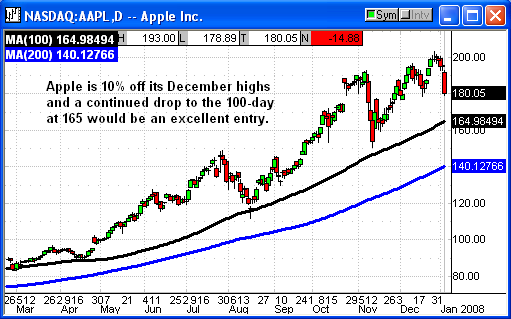 I am not that positive on AAPL and feel it could have further to fall. An ideal entry on AAPL would be somewhere in the $165 range but there may be too many people ready to jump the gun to see a continued dip to that level. Apple will get a boost from MacWorld before Jan-18th. That means we should see a bottom sometime next week. The biggest worry for me is the Dow and the potential for a confirmed head and shoulders failure with a break of 12800. The Dow closed at a nine-month low on Friday and right at critical support. 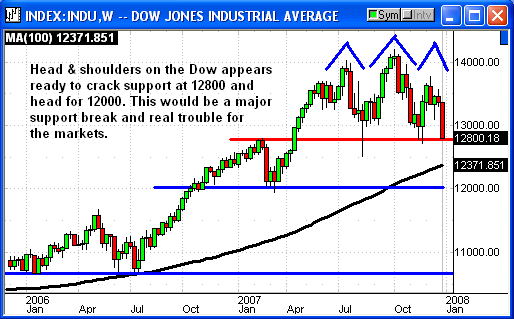 On a closing basis the Dow has broken a 6-month head and shoulders. On an intraday basis it is right at the neckline. Either way 12800 is critical support and a break here almost guarantees a retest of the February lows at 12000. Let's hope this does not happen. 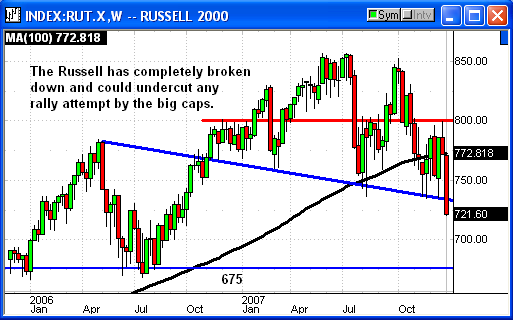 Nothing says ugly better than the Russell-2000 chart. I warned you last week that the Russell would telegraph fund manager sentiment and judging by this telegram it is extremely bearish. Friday's close was a 16-month low and there was no attempt to buy the dip. This is purely recession related rather than tax selling. Small caps do terrible in a recession and Friday's Jobs numbers scared the dickens out of any fund holding small caps. 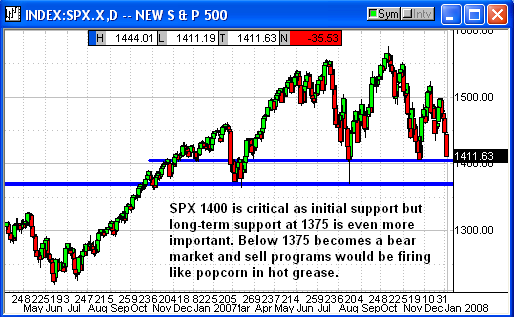 This could be the failure point for any SPX 1400 rebound. The bulls may show up to buy 1400 only to be devoured by the small cap bears. Wild cards for next week will include the JP Morgan Healthcare conference, a major event that could generate interest in any number of health related stocks. The New Hampshire primary on Tuesday will be another lightning rod for healthcare with half the candidates against nationalized healthcare and the others for it. Whoever comes out of NH with a vote lead could influence investor votes on those same stocks. Something else I expect to see would be the influx of year-end retirement contributions. All those billions in contributions hitting funds last week will be cleared and ready to put to work next week. This is tens of billions of dollars and they have the perfect dip to buy. Since a lot of that money goes into index funds this is a market-lifting event in normal years. The problem here is the recession worries generated by the ISM and Jobs reports. Fund managers don't really have a lot of discretion on those index funds and they will have to put the money to work very soon even if the market continues to fall. I wrote about the earnings and that only two sectors are in the negative category for estimates. That suggests to me the health of most sectors other than financial and maybe transportation are fine. The vast majority of analysts at Friday's close were screaming sell but that can also be a contrarian indicator. If we are not yet in a recession, earnings are still decent and the Fed is expected to ride to the rescue at the end of January or sooner then this becomes a buying opportunity. Tax selling was anticipated and the bears got help from the jobs report. End of story. At least I hope it is the end of the story. With CES, the JPM Healthcare Conference and MacWorld over the next ten days we should see buyers reappear. Here is my best guess at a scenario for next week. Monday becomes washout day as traders on extended holiday come back to work and barf all over their charts. Margin calls are covered and the flush ends. On Tuesday buyers appear and the bulls get a running start heading into mid-week. A battle forms when the bears try to short the rally. If support holds the bulls charge ahead and into mid January, MacWorld and the meat of the earnings cycle. If support fails after Monday we go back to bed and set the alarm for the following week and try again. You should be short from 1490 if you followed my suggestions. I would look to exit that short around 1400 and look to buy any bounce from that level. Should 1400 fail I would look to buy 1380 as a fall back position. If 1380 breaks the market has imploded and we load up on shorts and look for something in the 1235 range for a bottom. If we do go into implosion mode then Russell 675 would be a potential bottom for fund managers to buy in the small caps. I would look to pickup some IWM calls at that level should disaster strike. 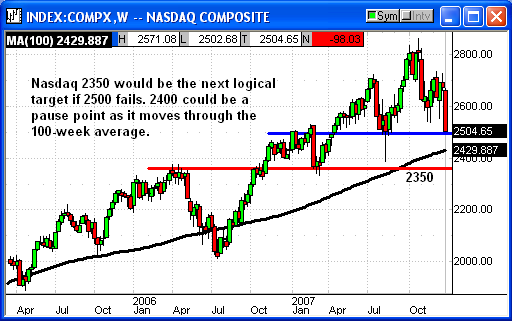 Initial Nasdaq support is 2400 if Friday's close at 2500 fails. If the Dow fails at 12800 it has risk to 12000. At face value the market appears headed deeper into the red. If that face value is wrong, as it has been so many times in the past, we will be ready for it next week. TThis is the last week for the End of Year Renewal special. If you have not yet renewed this is the cheapest way to subscribe plus you get a bunch of freebies including the peak oil video, five special reports and the 2008 mouse pad. Thank you again for your continued support of the Option Investor family of products! Play Editor's Note: Here's the plan. Monday could still see some follow through lower as retail investors read the weekend headlines and decide to sell. This could provide a short-term wash-out and a temporary bottom. Note that I said "could" provide. 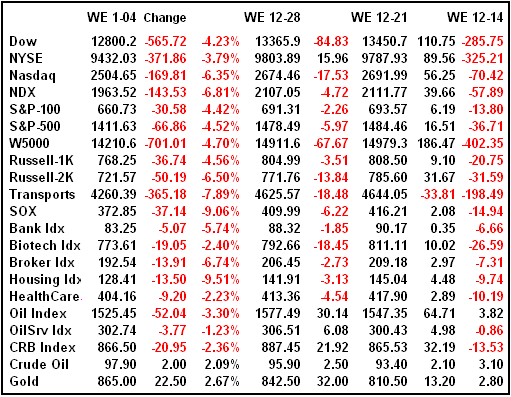 However, after such a sharp sell-off all the major indices look oversold and due for a bounce. We think it will be a bounce we can trade for a few days. We're listing some bullish candidates below but most have triggers to try and catch a dip on Monday. 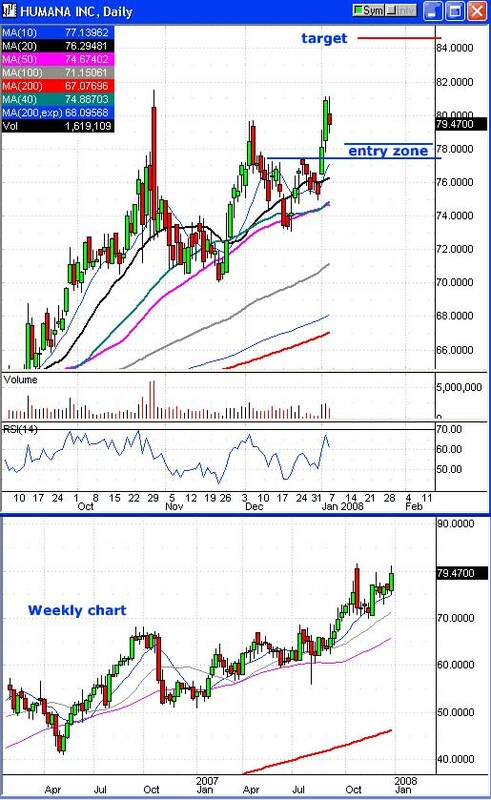 FYI: Two more stocks we are strongly considering as bullish candidates are MUR and RIMM. 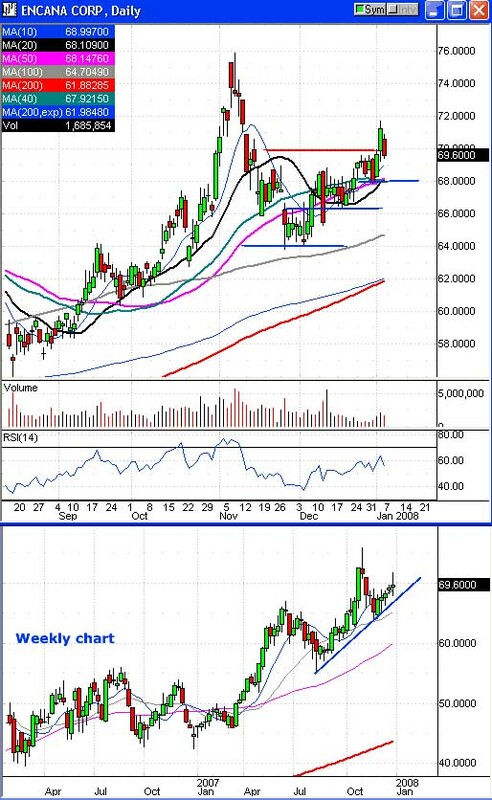 Look for a dip in MUR toward support near $80.00. Watch RIMM for a dip into the $100-98.50 zone as a potential entry point for calls. I would suggest a stop loss on RIMM under $97.40. There has been no slow down in CVD's rally. The stock continues to stair step higher. CVD completely ignored the market's meltdown on Friday. Currently the stock is testing resistance near $90.00. We're expecting the market to dip again Monday morning so our plan is try and buy a dip in CVD. 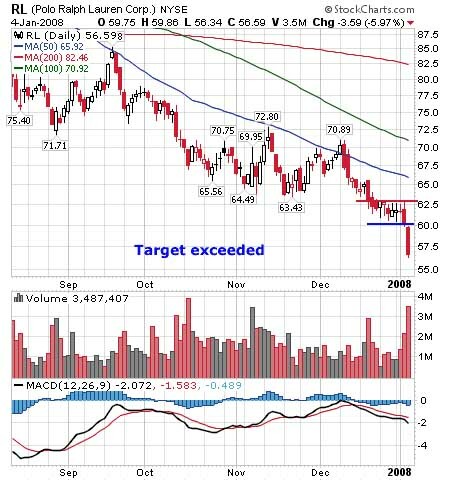 We're suggesting a trigger to buy calls on CVD in the $88.00-87.00 range. 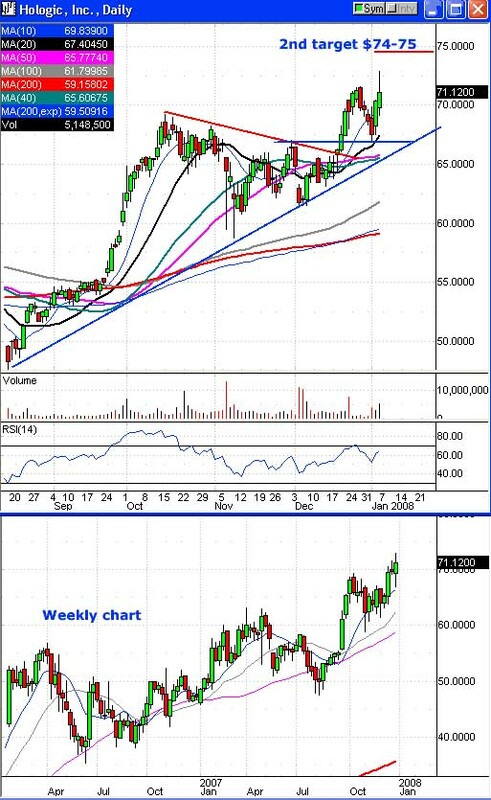 If the stock does not dip then momentum traders may want to buy a breakout over $90.50. We'll start the play with a stop loss under support near $85.00 and its 50-dma. Our target is the $94.50-95.00 range. We do not want to hold over the late January earnings report. We are suggesting the February calls. Our suggested trigger is the $88.00-87.00 range. HES has seen some pretty steep profit taking in the last few days but we think it's about over. The stock bounced almost perfectly from round-number support at $90.00 and its 38.2% Fibonacci retracement level (see chart). We're going to try and enter on a dip. We're suggesting readers buy calls on a move into the $92.00-90.00 zone. We'll attempt to limit our risk with a stop loss under support. 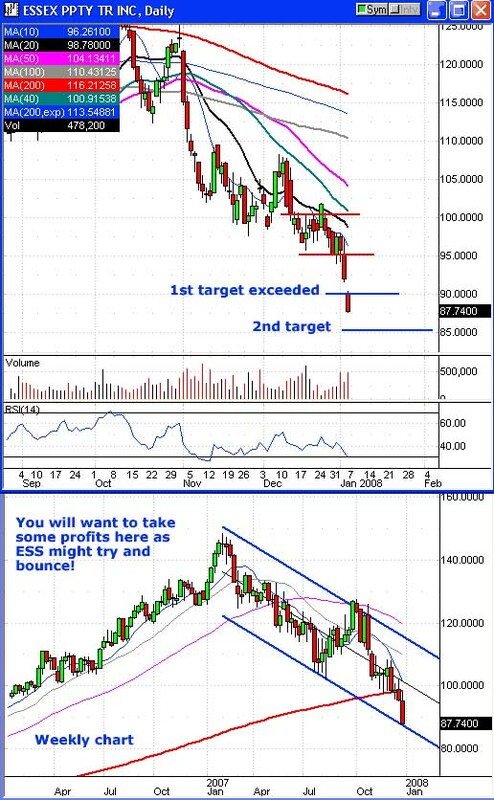 Our target is the $99.00-100.00 range. We do not want to hold over the late January earnings report. We are suggesting the February calls. Our suggested entry point is the $92.00-90.00 zone. Remember, it is up to the individual trader to decide which month and which strike price best suits your personal style of trading and risk. There has been no slow down in HUM's rally. Shares traded near all-time highs on Friday. 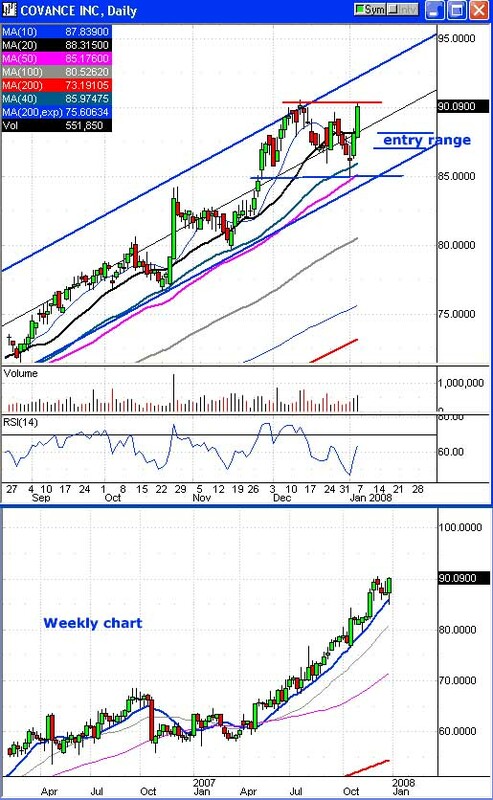 There is some resistance near $81.00 but we suspect that HUM will breakout past it. Healthcare stocks can been seen as safe haven plays in times of market volatility. Plus, there is a huge healthcare conference this coming week and HUM will be presenting. We are suggesting that readers buy a dip into the $78.50-77.50 zone. We'll start the play with a stop loss at $75.99. Our initial target is the $84.50-85.00 range. More aggressive traders may want to aim higher. The Point & Figure chart is bullish with a $96 target. We are suggesting the February calls. Please note that we do not want to hold over the early February earnings report. Our suggested entry point is the $78.50-77.50 range. IMA is another healthcare-related stock that was bucking the trend on Friday. Shares bounced from its 100-dma and the bottom of its wide, rising channel. Volume came in above average on the rally, which is positive. We're suggesting two alternative entry points. One entry point is $58.15 should IMA breakout past its 50-dma and the $58.00 level. Our second entry point would be a pull back into the $56.00-55.00 zone. We'll start the play with a stop loss at $54.49, just under Friday's low. Our target is the $64.00-65.00 range near its highs. FYI: IMA will be presenting at the huge healthcare/drug/biotech conference this coming week. We are suggesting the February calls. See play details for entry points. 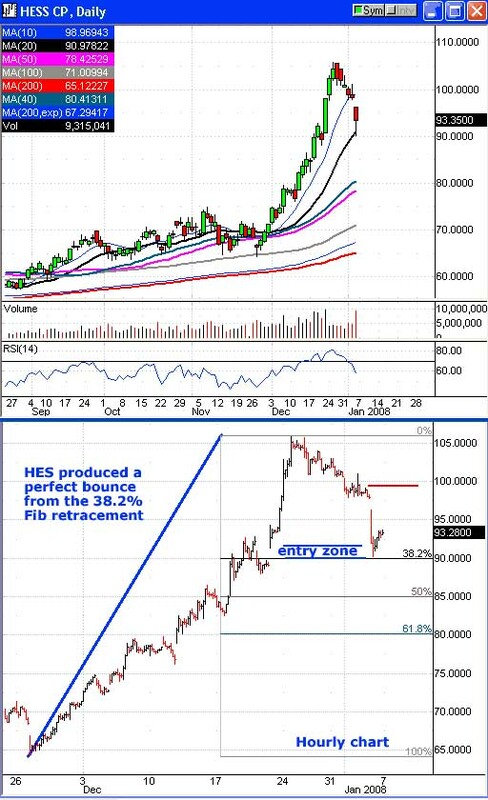 Friday's sharp market sell-off pushed ECA lower just one day after the stock broke out over resistance at the $70.00 level. Shares lost 2.2% and erased Thursday's gains. We remain bullish on ECA but readers can look for a dip into the $69.00-68.50 zone as a potential entry point. Our short-term target is the $74.85-75.00 range. FYI: The P&F chart is bullish with a $92 target. We are still suggesting the February calls. Remember, it's up to the individual trader to decide which month and which strike price best suits your trading style and risk tolerance. The situation with EGN is not looking healthy! Market weakness this week had killed the stock's bounce attempt. 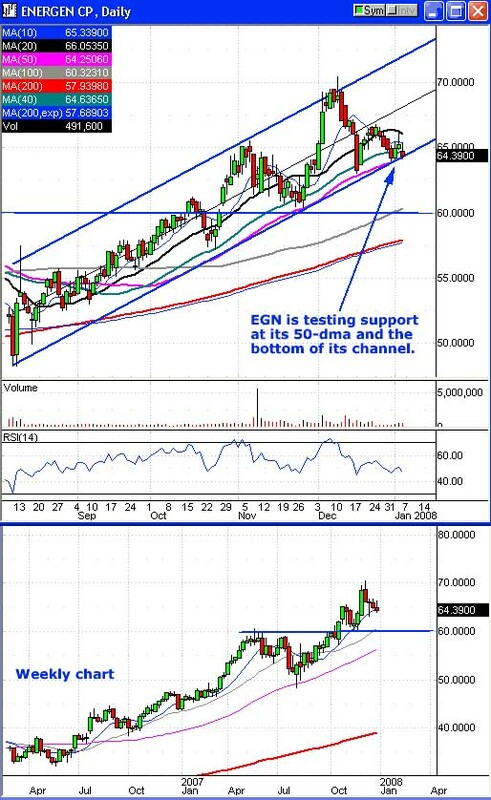 EGN remains in its bullish up trend and shares are consolidating against support near $64.00, the bottom of its rising channel, and its simple 50-dma. 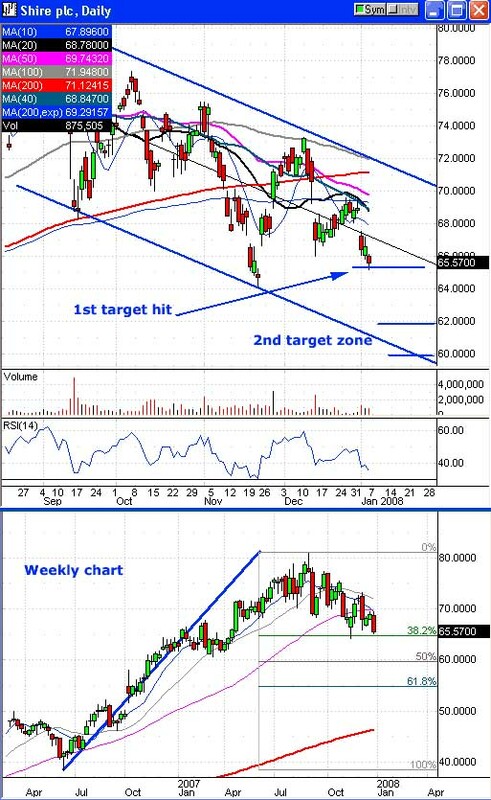 The challenge here is that EGN has developed a bearish pattern of lower highs that is suggesting the stock is going to breakdown under support. More conservative traders may want to raise their stops closer to the $64.00 level. What would really be frustrating would be to see EGN dip to $63 or $62 and then rebound back into its channel. Unfortunately, we can't take the chance that it doesn't rebound. A slip under the 50-dma would look like a sell signal for a decline toward $60.00. If EGN surprises us and bounces on Monday then readers can use it as a new entry point but shares do have short-term resistance near $66. 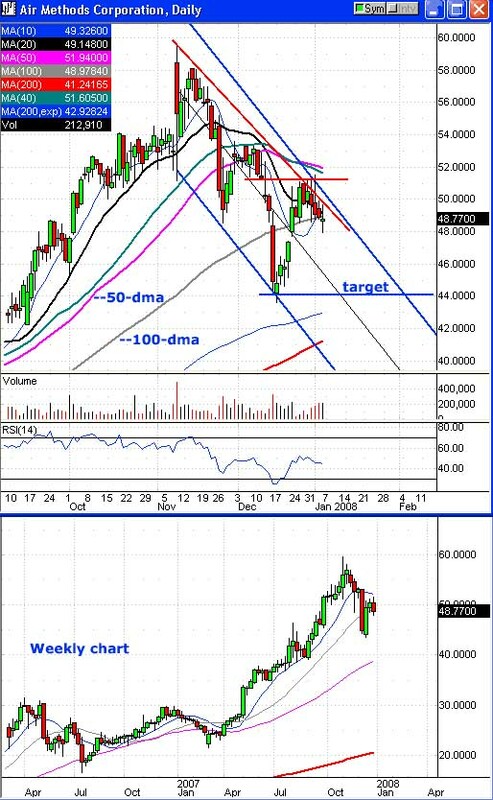 Our target is the $69.50-70.00 range. The P&F chart is bullish with a $74 target. If EGN provides another entry point we would suggest the February calls. However, we do not want to hold over the late January earnings report. We certainly can't be disappointed with ESRX. The stock has continued to show relative strength. Shares hit another all-time high at $75.67 before eventually succumbing to market weakness. We would look for a dip in the $72.50-72.00 zone as a new bullish entry point to buy calls. Our target is the $77.50-80.00 range. The P&F chart is very bullish with a $97 target. If ESRX provides another entry point we would suggest the February calls. Remember that we do not want to hold over the early February earnings report. HOLX continues to impress. The stock ignored the market's implosion on Friday and shares of HOLX hit new highs at $72.88. The stock did pare its gains by the close but still posted a 1.1% gain. Considering this market environment it would not hurt to take some money off the table with a little profit taking of your own. We are going to inch up our stop loss to $66.45. HOLX has already hit our initial target in the $69.50-70.00 range. Our more aggressive target is the $74.00-75.00 range. FYI: The P&F chart is bullish and points to an $87 target. FYI: HOLX is due to present at an investor conference in San Francisco on January 9th. We are not suggesting new positions in HOLX at this time. 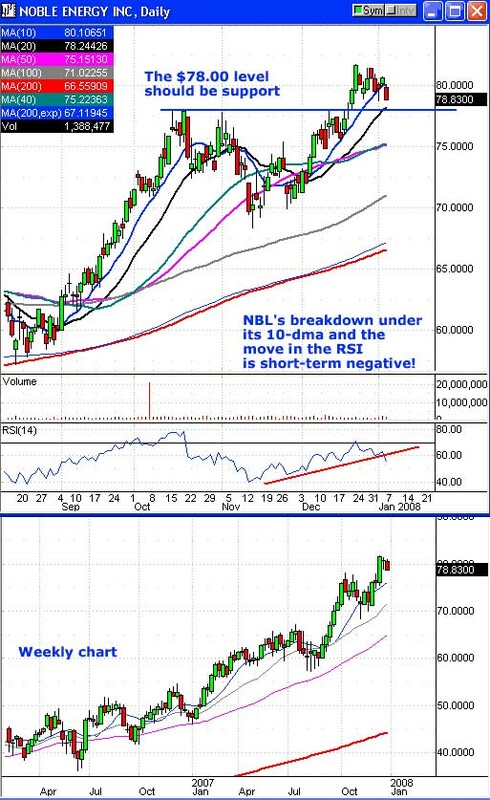 Traders need to turn more cautious on NBL. Shares slipped back toward the bottom of its two-week trading range. 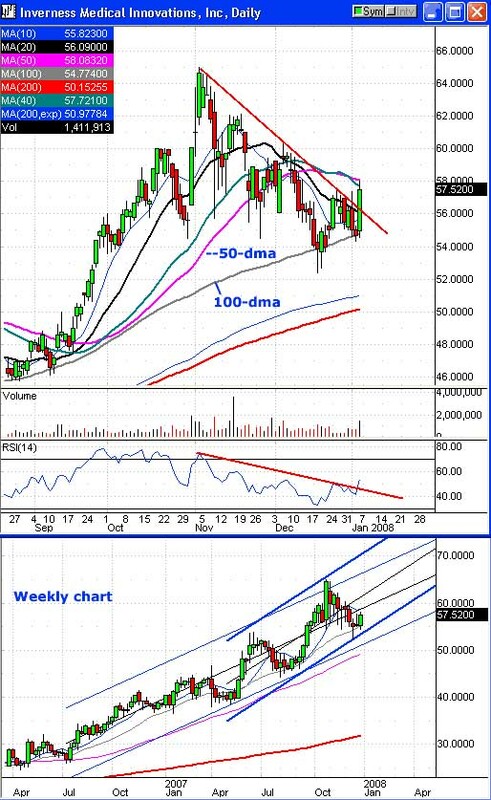 Furthermore we're seeing new sell signals on the daily chart's MACD and RSI indicators. Broken resistance at $78.00 should be new support. Watch for another dip or bounce near $78.00 as a potential entry point for new calls - but readers may want to consider adjusting their stops closer to the $78.00 level. Our target is the $84.50-85.00 range. The P&F chart is bullish with an $86 target. If NBL provides a new entry point we would suggest the February calls. Hmm... we added AIRM on Thursday night with a suggested trigger to buy puts at $47.95. The intraday low on Friday just happened to be $47.95. Yet if we look at an intraday chart we don't see AIRM trading under $48.05. 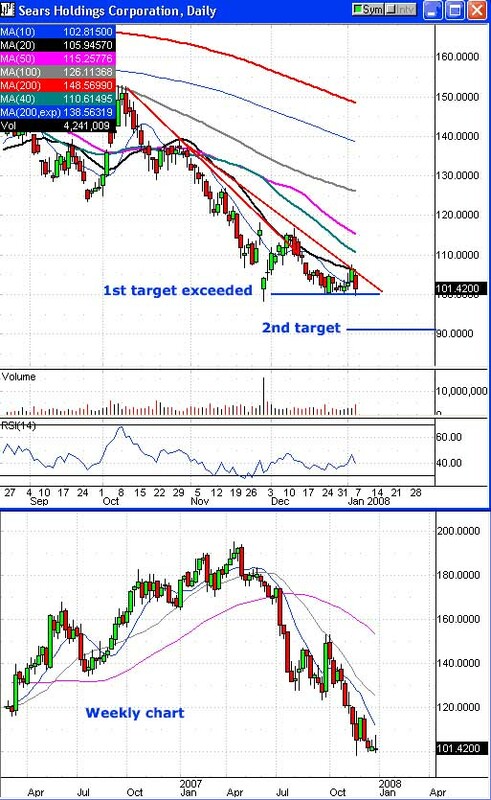 We've been playing these "bad ticks" so we're going to open the play but we suggest readers wait for a real decline under $48.00 before initiating new positions. What worries us is the lack of movement on Friday. The market crashed and AIRM only loses 13 cents? That doesn't inspire any confidence if you're a bear. Our target is the $44.10-44.00 range since the $44 level should be support. More aggressive traders may want to aim for the 200-dma near $41-42. The P&F chart is bearish with a $39 target. Something to be aware of is AIRM's high degree of short interest. The most recent data put short interest at almost 16% of the stock's very small 10.6 million-share float. We normally don't play stocks that have an average daily volume under 250,000 shares. AIRM's volume is under that amount. The combination of low volume and high short interest probably makes this a higher-risk, more aggressive play. We are suggesting the February puts. Our suggested trigger to open positions is $47.95. With recession fears looming the material stocks like ATI got hammered on Friday. The stock dropped 3.78% and closed right near support at $82.50. More conservative types might want to do a little profit taking right here. We're still looking for a drop into the $80.50-80.00 range. Please note that we're adjusting the stop loss to $88.75. We are not suggesting new positions at this time. 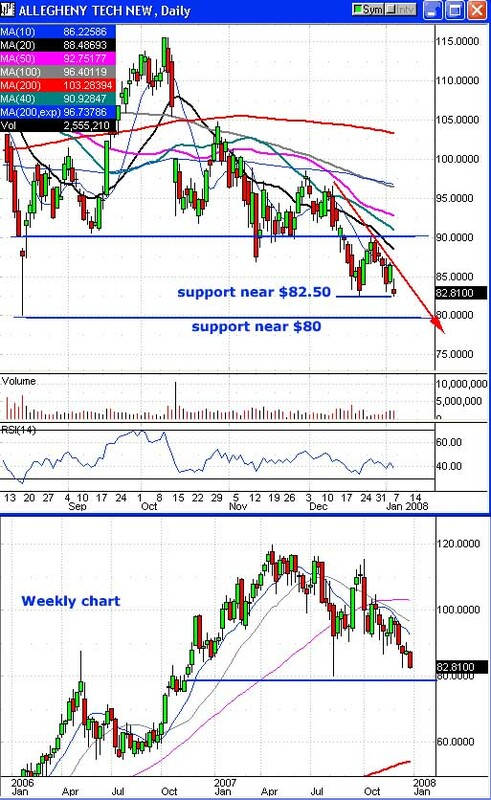 Once again BA is testing support in the $86.00-85.60 region. The stock looks poised to move lower but this is where we should expect a bounce. We highly recommend that readers do some profit taking right here. We're not suggesting new positions at this time. If BA does not breakdown under $85 on Monday we might consider an early exit and just close the play. We have two targets. Our first target is the $85.55-85.00 range. Our second target is the $81.50-80.00 zone. The P&F chart is bearish with a $75 target. We are not suggesting new positions in BA at this time. Target exceeded. Many of the REIT stocks just got hammered on Friday. 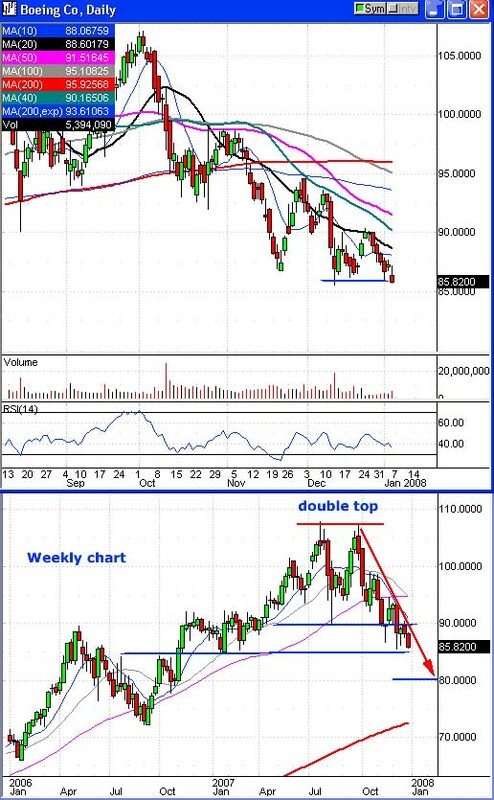 Shares of ESS gapped open lower and broke down below round-number support at the $90.00 level. The stock closed at new two-year lows. Our first target was the $90.25-90.00 range. Please note that we're adjusting our stop loss to $95.34. If you have not taken some money off the table you need to do so now. Our second target is the $85.50-85.00 zone. We do not want to hold over the early February earnings report. FYI: Our biggest risk is a short squeeze. The most recent data puts short interest at close to 16% of the 22.9 million-share float. That is a relatively high amount of short interest and a small float. This does raise the risk for this play. We are not suggesting new positions in ESS at this time. We would have expected a much bigger decline in ICUI on Friday given the market-wide weakness. The lack of a real follow through lower makes us nervous. The trend is still bearish so we're going to keep the play open but we would not place any large bets here. Right now I'm contemplating an adjustment to the stop loss toward $36.60. We are listing a trigger to buy puts at $34.90. 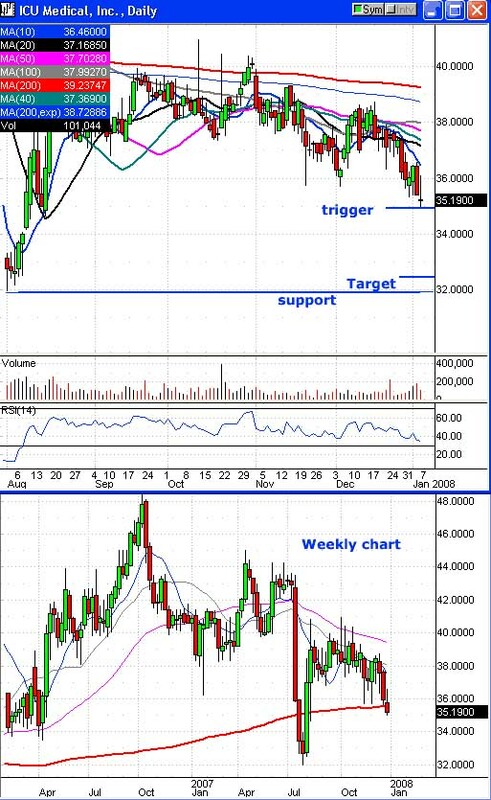 If triggered our target is the $32.50-32.00 range. The P&F chart is bearish with a $31 target. Please note we are labeling this an aggressive, higher-risk play because of the stock's very low volume and its short interest. The most recent data put short interest at more than 21% of the very small 12.3 million-share float. That raises the risk of a short squeeze should the stock suddenly shoot higher. We are suggesting the February puts. Unfortunately, we don't have a lot of choices. We'd like to see some $37.50 of $32.50 strikes but they're not listed. Shares of SHLD got slammed back to support near $100 on Friday. The fact that support near $100 held is good news if you're a bull. We still expect some weakness on Monday. 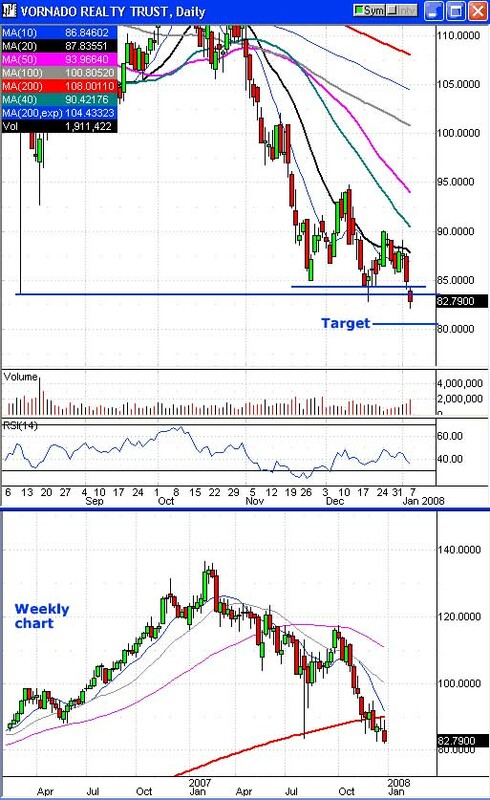 If shares of SHLD do not breakdown under the November $98.25 low then we will strongly consider closing the play early. SHLD has already hit our initial target in the $100.50-100.00 zone multiple times. We are not suggesting new bearish positions at this time. A breakdown under $98 would look like a new bearish entry point for puts. The P&F chart is bearish with a $78 target. Our aggressive target is the $92.50-90.00 zone. FYI: Longer-term traders may want to aim for $80, especially on a new relative low. Target achieved. SHPGY dipped to $65.18 on Friday. Our first target was the $65.25-65.00 range. The trend is still bearish in SHPGY but more conservative traders may want to exit early right now. Next week begins a massive healthcare/drug/biotech conference and the three sectors could see enough positive news to turn higher. We are not suggesting new positions in SHPGY at this time. The $65 level is round-number, psychological support so this is where we would expect a bounce. The $68.00 level should be overhead resistance. Our second, more aggressive target is the $62.00-60.00 zone. The Point & Figure chart is bearish with a $54 target. FYI: Any time we play a biotech or even a drug stock we're dealing with a higher-risk situation. We are at risk that some FDA decision or some clinical trial news could send the stock gapping one direction or the other. VNO, like many of the REIT stocks, turned lower on Friday. The stock hit a new 21-month low and did so on big volume. Shares look poised to drop toward the $80 region. Our initial target is the $80.50-80.00 range. We are considering a second, more aggressive target near $75. Currently the P&F chart is bearish with a $73 target. We would not want to hold over the late February earnings report. More conservative traders may want to tighten their stops but remember VNO can be a volatile stock. We have two weeks left before January options expire. That's not much time. ECA needs to see a significant move if we're going to be successful here. Odds are not in our favor. If given the chance readers will want to consider exiting early to salvage any capital. This was a high-risk speculative play but that doesn't mean we have to wait for the options to expire worthless. We're not suggesting new strangle positions at this time. The options we listed for the strangle were the January $75 calls (ECA-AO) and the January $60 puts (ECA-ML). Our estimated cost is $0.65. We want to sell if either option hits $1.25 or higher. FYI: The P&F chart is bullish with a $92 target. We are not suggesting new strangle positions in ECA. Target exceeded! The bulls finally caved in on RL and the stock crashed through support at the $60.00 level. Volume was very big on the 5.9% sell-off. Our target was the $58.00-57.00 range. Broken support near $60 should now be overhead resistance. Two weeks ago, I again this year addressed the ugly issue of wash-sale calculations for active traders. Last week's article introduced one way some traders change their trading patterns in December or January in an attempt to avoid those wash-sale calculations. This week's article introduces a more permanent solution but one with some drawbacks. If you haven't read the previous two articles, it's probably best that you review them before continuing with this article. They can be found here and here. This series of articles reprises one that I wrote last March. Introducing it earlier this tax season seemed a better idea. That provides more time to ask tax professionals about the ideas introduced in these articles. While I'm on the subject of questioning tax professionals, I want to reiterate that I'm not one. The topics discussed in this series of articles are meant to alert you to topics to discuss with your tax professional, not to give advice. If you've read the previous articles, you know that there's some confusion, even among IRS employees, about the interpretations of some of these aspects of reporting your taxes. I'm always surprised each year to learn that some traders don't know anything about the wash-sale calculations. Neither, apparently, do some of the accountants who have been calculating their tax returns. Some traders find a permanent solution to those troublesome wash-sale calculations. They elect the mark-to-market method for accounting for their trades. That permanently erases the need for wash-sale calculations. None are needed. Ever. However, making that election is fairly permanent, too, so traders need to know it's the right choice for them. It's not always easy to choose mark-to-market status, and it's nearly impossible to undo it, according to several sources. IRS Publication 550 sets forth the standards for this election. If you're considering electing the mark-to-market accounting choice for 2007, you must file a statement with the IRS saying that you want to do so for the 2007 year by April 17, 2007. You would attach the statement to your individual income-tax return or to a request for an extension of time to file that return, if that's what you're doing. Publication 550 sets out the requirements for what you should include in that statement. There's a problem in updating this article for the 2007 tax year, however, and in advising you right now to consult Publication 550. As of 12/28/2007, the IRS says, "The 2007 revision of Publication 550 . . . has been temporarily removed from www.irs.gov. We regret any inconvenience this may cause and will post the revised version as soon as it becomes available." Obviously, new revisions are being considered. I knew that there had been complaints that some revisions had not been completed and that some taxpayers might see their returns delayed this year as a result. I didn't know that those revisions involved this publication. All I tell you is what existed as of the 2006 tax year and alert you that changes may be afoot. The article's focus isn't impacted. That focus was to let you know what you might need to check out with your tax professional and not to give specific advice. Some publications warn that once traders have elected the mark-to-market status, the IRS seldom lets them change that election. Doing so might require setting up a new account and a new trading business in order to change that election, some publications warn. Verify whether this works to change that election with your tax professional. Whatever that tax professional tells you, it's obvious that traders need to be sure that the mark-to-market accounting method is right for them before they submit that statement to the IRS. In addition to removing the need to ever perform wash-sale calculations again, the mark-to-market method changes the way taxes are reported in a way that's beneficial for some traders and not for others, or it did up through the 2006 tax year. All trading-related gains and losses are reported as ordinary income and losses rather than capital gains and losses. According to the sources I consulted, that means that all losses can be deducted against other income in the year they're incurred rather than limiting you to $3,000 in a single year. You can even carry losses back two years, if you have no other income that offsets that loss, amending the previous two years' tax returns. You might end up receiving a refund for those previous two years. Another difference, the one from which the name "mark to market" election derives, is that any securities held at the end of the year are treated on paper as traders have closed them out and then bought them back at the beginning of the next year. They're marked at the market price that last day. Trading books are effectively closed on the year and then opened the next year with that same trade. In the words of the IRS on the 2006 publication, "A trader in securities or commodities may elect under section 475(f) to use the mark-to-market method to account for securities or commodities held in connection with a trading business. Under this method of account, any security or commodity held at the end of the tax year is treated as sold (and reacquired) at its fair market value (FMV) on the last business day of the year." However, when traders elect mark-to-market status, they lose that favorable split. Traders who trade a lot of equity stocks or their options might not care; traders like me care a lot. I trade options on broad-based indices almost to the exclusion of anything else. I'd lose that 60/40 split that I get on almost all my trades. Taxes on long-term trades are much more favorable than on short-term ones, so I want that split. When you're making that decision, you want to know which indices qualify as Section 1256 trades and which are considered narrow-based indices. The IRS sets forth those rules describing the various types, of course, but I certainly couldn't find anything more descriptive. I'm sure it's buried somewhere deep in the IRS code, and your tax professional should know them. Other sources offer more concrete examples, if they can be trusted. For example, another source says indices would be considered narrow based if they "contain nine or fewer component securities, if a single component security comprises more than 30 percent of its weight, or if the aggregate of the five highest-weighted component securities comprise more than 60 percent of its weighting" (www.twenty-first.com/exchange-traded_index_options.htm). On that link, last updated on November 21, 2007, you can find a listing of indices and their classifications as either broad-based or narrow-based indices. If you last checked such listings several years ago, you may be surprised to find more indices listed as broad based than was previously true. Gains and losses from Section 1256 securities are reported on IRS Form 6781 rather than on a Schedule D. You'd be surprised how many active SPX and OEX traders don't know that. As noted in previous articles, various sources offer conflicting information as to whether traders must detail each trade on that IRS Form 6781 as is done with a Schedule D. Most sources note that the gains and losses are taken straight from your brokers' 1099s and plugged into the appropriate lines on IRS 6781. Then the 60/40 split is made as directed on that form, without any need to document each trade. Pretty nifty, huh? The problem is that many brokerages, and maybe even most of them, don't include options trades on 1099s. The instructions accompanying IRS Form 6781 says that you should "[l]ist separately each transaction for which you did not receive a Form 1099-B or equivalent statement." That includes the 2007 version. If your brokerage doesn't include options trades on your 1099s, you're going to need to consult a tax professional to decide whether each trade needs to be listed separately. I did list each last year. Perhaps that was overkill according to some sources, but when the IRS says "list separately," I list separately. Section 1256 securities do share something in common with the mark-to-market accounting election. Section 1256 securities must be marked to market at the end of the year. A Cornell Law School website defined a Section 1256 contract and also suggests that such a contract would be "treated as sold for its fair market value on the last day of such taxable year." The instructions accompanying IRS Form 6781, the 2007 version, say, "Under these rules, each section 1256 contract held at year end is treated as if it were sold at fair market value (FMV) on the last business day of the year." It says something else that's music to an active SPX, OEX or other 1256 contract trader's ears: "The wash-sale rules do not apply." Yippee! This mark-to-market requirement for 1256 contracts does not relate to the accounting method you choose. Despite the similarities in names and the need to mark to market certain trades, electing the mark-to-market method for accounting for all your trades is a separate consideration from the need to mark to market your Section 1256 trades. Make sense? I didn't think so, but I didn't write the IRS code, so I can't be blamed. It should be obvious that traders and their tax professionals should do some thinking about the types of trades that predominate in traders' accounts and whether the benefits of electing mark-to-market status outweigh losing that favorable 60/40 long-term/short-term split. Next week's article will bring up another topic that should be considered: whether electing the mark-to-market accounting method is the only way to obtain the right to deduct trading-related expenses. As I've noted the last few articles, if you can't wait until the completion of this series, you can go back to the original article from which it is reprised for information on the last topic to be discussed. That article can be found at this link. Today's Newsletter Notes: Market Wrap by Jim Brown, Trader's Corner by Linda Piazza, and all other plays and content by the Option Investor staff.